Governor Huntington, in a "state of the state"-style address, proposes modifying the taxation system and state militia, building new roads, and granting the Superior Court power to send a wider range of convicts to New Gate Prison. The speech also emphasizes the importance of education, for the continued strength and vitality of republican institutions, a recurring theme in his administration. 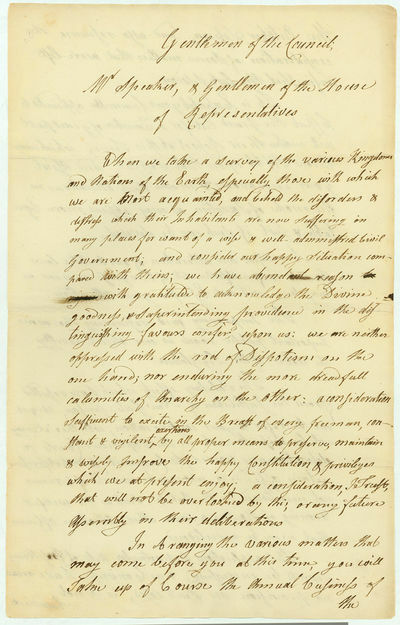 "Let me observe...a firm belief that it is Impossible for a free people to preserve their liberties & privileges... unless useful knowledge is generally diffused among them, & the principles of Virtue & religion included …; and were these favours properly bestowed upon every rising generation, …all Arbitrary & Despotic Government would vanish away..." SAMUEL HUNTINGTON. Autograph Speech Signed, October 11, 1792, [Conn.] 4 pp., 8 x 12¾ in. When we take a survey of the various Kingdoms and Nations of the Earth, especially those with which we are most acquainted, and behold the disorders & distress which their Inhabitants are now suffering in many places for want of a wise & well-administered Civil Government; and consider our happy situation compared with theirs; we have abundant reason with gratitude to acknowledge the Divine goodness & superintending providence in the distinguishing favors conferd upon us: we are neither oppressed with the rod of Dispotisim on the one hand; nor enduring the more dreadfull calamities of Anarchy on the other: a consideration Sufficient to excite in the Breast of every freeman, constant & vigilant exertions by all proper means to preserve, maintain & wisely Improve the happy Constitution & privileges which we at present enjoy; a consideration, I trust, that will not be overlooked by this or any future assembly in their deliberations. In bringing the various matters that may come before you at this time, you will take up of course the annual business of  the October session, and also resume the consideration of some matters that were left unfinished the last session. It is expected your Committee appointed to inspect the grand list for a member of years past will make their report at this time, which may throw light upon that subject, and assist your endeavors to make such alterations in the mode of taxation as may appear more equitable & just if such can be devised. A revision and alteration of our militia laws in conformity to the Act of Congress as near as may be will not escape your attention. The improving and repairing the more important public roads is an object worthy the notice of the Legislation. The salutary effects which have resulted from the institution of New Gate prison, urges me to refer to your consideration, whether it may not be wise to vest in the Superior Court a discretionary power to commit to that prison certain offenders who may be convicted of crimes not mentioned in the Statute, such as the willful burning of houses & some other attrotious offences that may be mentioned. The applications for particular Acts of Insolvency seem to be increasing, & as Congress have made no provision in such cases, is it not expedient  that the legislature of this state should make some regulation relative to the subject, in particular to prevent a preference of debts in favor of the first attacking creditors of a bankrupt estate. There exists also another difficulty respecting those particular Acts of Insolvency: They appear prima facie, to be ex post facto laws, and in that view may perhaps be called in question as being repugnant to the Constitution of the nation & void; to the great disadvantage of honest debtors who may have religiously conformed to such Acts. You will remember that no provision hath been made by Government for the Support of Schools the present year. Perhaps it may be thought by some that this subject hath been too frequently reiterated from the Chair; But let me observe that it arises from the impression of a firm belief that it is Impossible for a free people to preserve their liberties & privileges with a regular & energetic Government, unless useful knowledge is generally diffused among them, & the principles of Virtue & religion included so as to obtain a governing influence upon the visible conduct & deportment of the inhabitants; and were these favors properly bestowed upon every rising generation I am fully persuaded that all Arbitrary & Despotic Government would  vanish away. There are doubtless other matters which may claim your attention in the course of the session, which you will take into consideration as your wisdom & providence shall direct. I shall be happy in co-operating with you to give all reasonable & proper dispatch in the best manner; to the business that may come before during the session. After his two years as President of the Continental Congress, and his brief service as first President of the United States in Congress, Samuel Huntington retired from public life, hoping to revive his law practice and fortune. Popular acclaim and unstable politics back home in Connecticut brought him back into the public sphere rather quickly, however. In 1784, he was elected Lieutenant Governor, a post which, at the time, made him Chief Judge of the Connecticut Superior Court, and which proved a logical jumping-off point to the governor's office. Huntington's election and subsequent popularity as governor was, as biographer Larry Gerlach argues, less a function of charisma and energy, and more a product of his desire and ability to stand "aloof from partisanship." Like George Washington in many respects, his political career "was one of moderation and balance" (85). On the one hand, Huntington favored strengthening the powers of the national government and ratifying the Constitution, but he also jealously guarded the rights of Connecticut to its western lands on the basis of its colonial charter. During Huntington's administration, Connecticut gave up its right to the northern third of Pennsylvania and to most of the Northwest Territory, but achieved recognition of its preemptive land rights in the "Western Reserve" (now northeastern Ohio). Connecticut's fiscal status was strengthened by its ability to sell lands in the Western Reserve, and Huntington, while governor, ensured that Connecticut was well-represented at treaty councils with Indians of the Ohio territory so as to acquire lands by advantageous deals. This 1792 message to the legislature highlights two of Huntington's points of emphasis as governor: penal reform and education. "New Gate" Prison was the first state prison in the United States. In the revolutionary era, a humanitarian movement resulted in significant reforms, including the abolition of antiquated corporal and capital punishments in favor of asylums with workhouses to improve criminals' character and behavior. These reforms had already been commenced in Connecticut; here, Huntington simply seeks additions to the list of crimes comprehended as punishable by prison time, while commending the legislature for its outlay of funds in the "infiltration" of New Gate, which produced "salutary effects." Huntington also eloquently underscores the importance of state governmental commitment to the education of youths for the long-term viability of republican government. As Gerlach notes, Huntington "called upon the General Assembly to provide financial aid to the schools and direct local officials" to initiate systems of visitation and inspection "with an eye to upgrading instruction (94)." Gerlach, Larry. Connecticut Congressman: Samuel Huntington, 1731-1796 (Hartford, Ct., 1976). In an endnote [p. 129 n. 25], Gerlach states: "Full texts of the following messages at the commencement of legislative sessions are extant: October 1786, May and October 1787, May and October 1788, October 1791, May 1792, May 1793, May 1794, and May and October 1795. See Connecticut Courant, November 20, 1786, May 21, 1787, May 12, 1788, and November 27, 1788 … For the only printed version of a closing address, that of October 1786, see the Courant, November 20. Summaries of his concluding remarks in May 1790, October 1790, May and October 1793, May 1794, and May and October 1795 are in State Records, VII, 171, 207, and VIII, 83, 126, 182, 303, and 356." 30 day return guarantee, with full refund including shipping costs for up to 30 days after delivery if an item arrives misdescribed or damaged. Authenticity guaranteed for the life of the book or document.